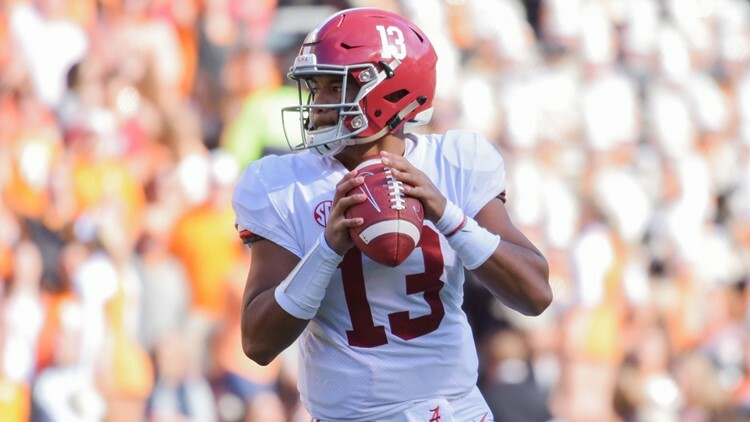 Alabama Crimson Tide quarterback Tua Tagovailoa looks to pass the ball against the Tennessee Volunteers during the first half of their game on Oct. 20, 2018, at Neyland Stadium in Knoxville, Tennessee. ESPN's College GameDay travels to Baton Rouge, as No. 4 LSU hosts No. 1 Alabama. The 10th week of the college football season has many questions. Journalists/wannabe college football insiders Mark Bergin and Lara Saavedra try to answer some of them. What’s your tweet-length reaction to Week 9 of the college football season? Mark Bergin: Texas is back! Florida State suffered its worst loss ever at Doak Campbell Stadium in Clemson’s 59-10 thrashing of the Seminoles. It tied for the school’s worst margin of defeat ever, matching a 49-point loss to Florida in 1973. Lara Saavedra: Week 9 was kind of uneventful due to the fact Alabama, Ohio State, Auburn, Michigan, LSU and UCF all had a bye week. The most memorable moment honestly was this Northwestern coach getting ***hyped*** after the Wildcats’ win against Wisconsin. Loved. Every. Move. Which Week 10 game are you most looking forward to? Bergin: No. 6 Georgia at No. 9 Kentucky: Are the Wildcats actually legitimate this year or do the Bulldogs secure their way to their second consecutive appearance in the SEC title game? Regardless, the winner of this game – the SEC East winner – will likely get whipped by Alabama in the conference title game on Dec. 1. Saavedra: No. 12 West Virginia at No. 15 Texas: Texas’ loss to Oklahoma State last week against Mike Gundy and company has the Longhorns looking for redemption. It’s a chance to switch up the narrative on which team plays in the Big 12 Championship next month. It’s a tossup for me. The homer in me wants West Virginia to win. Bergin: Alabama, Clemson, Notre Dame (if the Fighting Irish remain undefeated) and Oklahoma. Bergin: Am I crazy to think a 14.5-point spread isn’t enough for the Alabama-LSU game? I know the game is in Baton Rouge, but I think the Crimson Tide go another week with Tagovailoa resting in the fourth quarter. Saavedra: Other than Saturday against LSU, I don’t think Tagovailoa will have to play in the fourth quarter for the rest of the season. Barring their opponent having a near-flawless game, I don’t think they’ll need to, but I think Tagovailoa plays against the Tigers. ESPN’s College GameDay heads to Baton Rouge, Louisiana as the No. 4 LSU Tigers host No. 1 Alabama Crimson Tide. Which team will Lee Corso pick? Bergin: Alabama is king of the hill until someone knocks the Crimson Tide off. How's this for a stat? Alabama is 8-0 against the first-half spread this year. The Crimson Tide are favored by 7.5 points in the first half Saturday against LSU. Saavedra: To pick anyone other than Alabama would be lunacy, but then again, Lee Corso is everyone’s goofy loveable uncle. He just might pick the Tigers. Note: The AP Top 25 Poll is used for the team rankings throughout this story.